This 100mm Aluminum Modular Filter Holder Kit with 93mm Adapter Ring from Formatt Hitech provides the necessary items to allow a lens with 93mm front filter threads to use Formatt Hitech filters up to 100mm wide. The Formatt Hitech 100mm Aluminum Modular Filter Holder is part of a system that will permit you to use numerous filters depending on your needs in order to create the shot you envision. It comes fully assembled but can be modified to accommodate the filters you require at any moment. It removes the traditional limitation of only three filters per holder by the use of the included plain and spring spacers. Using these included spacers, you can alter the configuration to accept resin or glass filters as thick as 4mm. The spacers can be arranged to accommodate up to three 2mm-thick filters, one 4mm-thick filter, or one 4mm and two 2mm-thick filters. 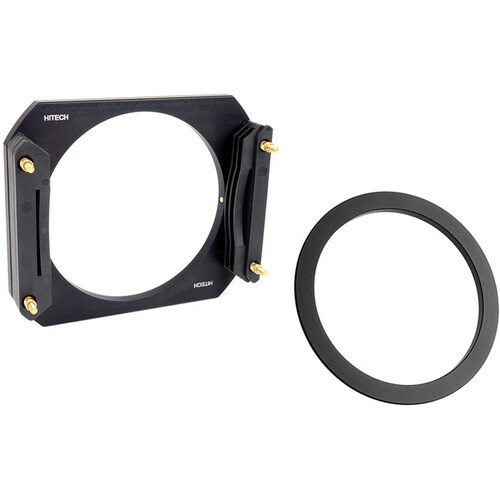 The Formatt Hitech 93mm Adapter Ring for 100mm Aluminum Modular Filter Holder allows that holder to connect to a lens with 93mm front filter threads.